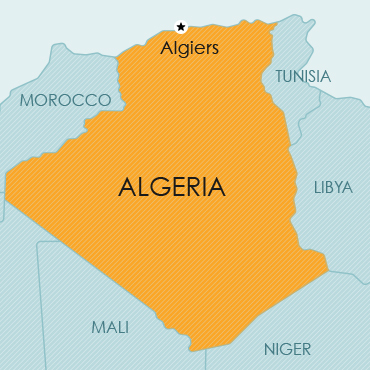 Algeria became an independent Republic in 1962. Algeria is situated on the north coast of Africa, bordered by Tunisia and Libya on the east, Niger on the southeast, Mali on the southwest, and Mauritania and Morocco on the west. Provision is made for the registration of trade marks for goods and for services, and for collective marks. No express provision is made for defensive marks. Algeria is a member of the Paris Convention, the Patent Cooperation Treaty and the Patent Law Treaty. Patent protection is obtainable by way of a national application, in appropriate circumstances claiming convention priority, or by way of an international application under the PCT. Certificates of addition may be obtained for improvements, and divisional patents may be obtained. Algeria is a member of the Paris Convention. Design protection may be obtained by way of a national filing. Since Algeria is a member of the Paris Convention, priority may be claimed. collections of works, collections of traditional cultural databases. handcrafts of metal, wood, basket, textiles, jewellery. Protection in general does not extend to ideas, concepts, principles, techniques, working procedures. Official documents also do not enjoy copyright, such as administrative laws, regulations, administrative contracts, justice rulings, etc.